Presenting our 3rd warrior, Kayden! “As an expecting mother we all wonder what our baby will be, we all want our babies to be healthy and usually expect that outcome we never expect the opposite. This is our heart journey of hope. I found out my baby was going to be a boy when I was about four months pregnant. The sonographer also noticed something about his face, she said it looked like he had a cleft lip which most of the time meant a cleft palate as well, so we were referred to another clinic to confirm it. At that clinic it was confirmed my son was going to be born with a cleft lip and palate, but also they noticed something about his heart and referred us to a pediatric cardiologist for a fetal echo. At the appointment with the cardiologist, I was told my baby’s heart was enlarged and he had a valve leaking. I was told he had dilated cardiomyopathy, and Ebstein’s Anomaly. I didn’t know what really went through my head after all of that. I know I worried a lot about what could happen, I knew he would have to be on a ventilator when he was born if his breathing was very bad, I also knew we might have to travel to Charlottesville, VA for him to be born, or I knew he might just need a little oxygen if his breathing wasn’t too bad. 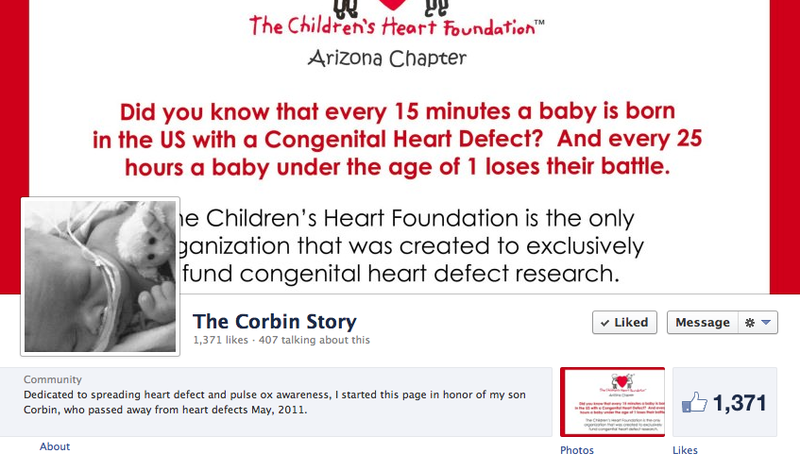 During the rest of my pregnancy from 4 months on, I went to the cardiologist for them to follow the babies heart. 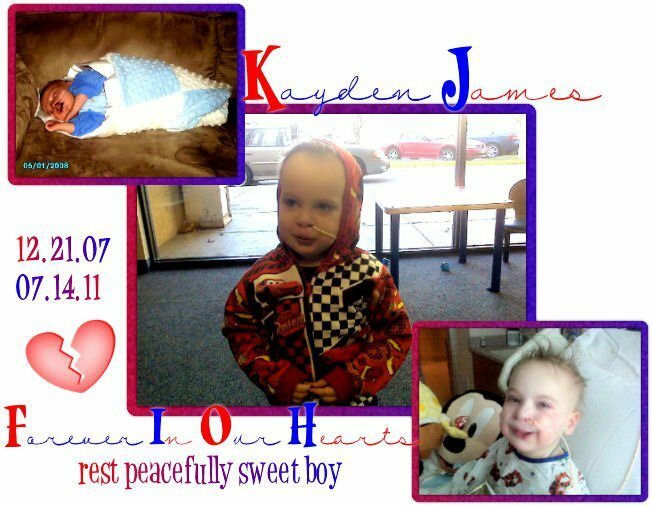 On December 20, 2007 I went in labor, I had the most handsome baby boy at 1:24 a.m. On December 21, 2007, I named him Kayden James. The nurses were in a hurry to clean him up, he was okay though, his breathing wasn’t horrible so all he needed was a little oxygen to help him breathe, so we didn’t have to travel that night, and he didn’t have to be put on a ventilator. 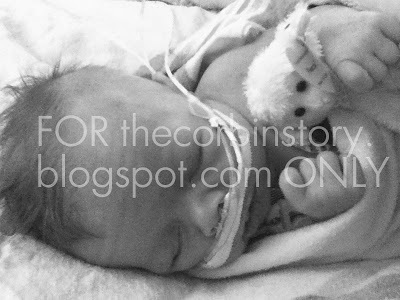 He was taken straight to the NICU due to his health conditions. Kayden stayed in the NICU for 2 weeks, over that time his heart had improved a little, the valve wasn’t leaking quite so bad, and they helped me learn to feed him since he had a cleft palate which affected the hard and soft palate. In January at 5 weeks old Kayden was sick, he wasn’t keeping anything down and it worried me so I took him to the emergency room. They couldn’t figure out what was going on with him so they admitted him, the next morning that did an ultrasound on his stomach and said he had pyloric stenosis. I had never heard of that in my life, but the way they explained this was the muscle your food goes through to digest your food has a little hole where the food passes through, Kayden’s was too small. They did surgery to fix that, I was so scared that my 5 week old baby with a heart condition was having surgery, I didn’t know what to expect. But thankfully he came through very well. During his first year, he had two more surgeries. One was a lip adhesion and the other was to finish the lip repair. He did great with, throughout the year his heart was getting a little better which was surprising or it stayed the same, it didn’t get worse so we were all okay with that. He had his palate repaired at 13 months, he did well with that. Kayden’s cardiology appointments at this point were more spread out. He was a great child, he would clean up after his self if you asked, he liked playing outside, he has an older sister who he loved to play with. If you were to see him you would think he was a normal child with nothing wrong. 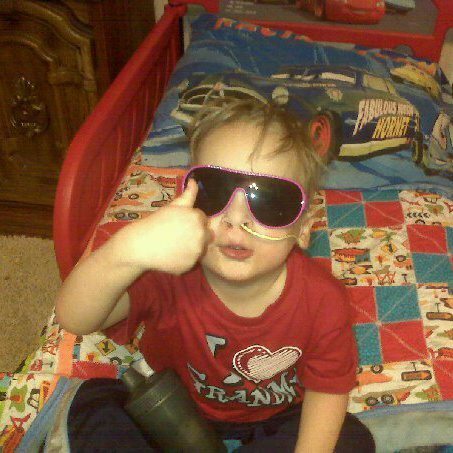 Thumbs up from a cool dude. Sometime during the spring of 2009, I noticed a lump next to his right ear. I was concerned because I had never seen anything like it. We went to his pediatrician and he said it looked like a preauricular cyst. When he was born he had a tiny pit on his ear, it wasn’t noticeable unless you looked at his ear, so the cyst formed from that pit. As months went by it would get smaller or bigger, he was being seen by an ear, nose and throat doctor for it. He was getting more ear infections which wasn’t like him at all considering he had a cleft lip/palate which would have made him for at risk for them and he never had one as a baby. In June of 2010, the ear, nose and throat doctor did surgery to remove the cyst. That morning he was fine, no fever or anything, but the cyst looked like it was getting infected again but the doctor still thought it was fine to do surgery. After the surgery, the doctor came to the waiting area and said he was fine, he got all of the cyst, but he said his ears were really infected and there was a lot of drainage in them. The rest of June, he kept getting sick, it was either a cold or ear infections or the cyst was coming back and it was more infected than before. July was the same way until the end of July I noticed his feet were swollen and his appetite had decreased. I took him to the pediatrician first because he wasn’t due to see his cardiologist until September and I couldn’t get an appointment before the following week. I honestly didn’t think it was heart related because his heart had been stable for a year by then. His pediatrician checked him really well, he noticed his liver was swollen and concerned that it was affecting his heart he got Kayden’s appointment with his cardiologist moved to the next day. That is when everything changed. I remember that day like it just happened an hour ago. His cardiologist came in the room, sat down and I could see in his face it wasn’t good. He said Kayden was in congestive heart failure. I was scared to death because I knew he might not make it. He told us to go get x-rays across the street and go straight to our PICU, not to admissions straight to the PICU. We got there and they were expecting us. That first day still seems like a blur because I was so scared and not sure what was going on I can remember bits and pieces of it, like them asking questions about his health, etc. He was transported to the University of Virginia that night. He was put on all kinds of different medications and stayed in the hospital for a little over a week. He recovered well. He came home, played outside, with the other kids, he was fine. Obviously he was followed very closely by the cardiologists and they weren’t sure what exactly to do. 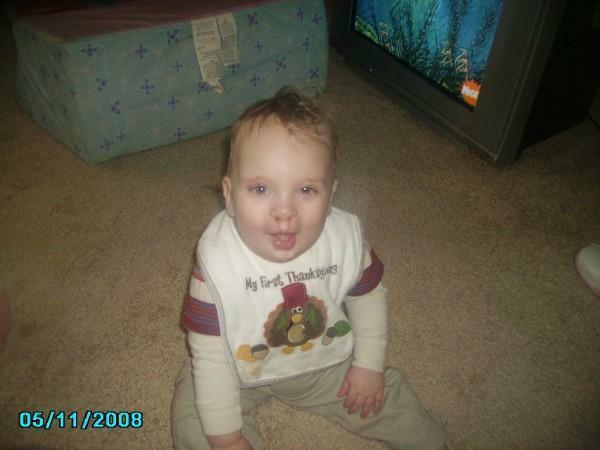 In November, Kayden had his first diagnostic cath done. The options were valve repair, valve replacement, or transplant. Afterwards, the cardiologist who done the cath said he didn’t think he would survive a repair of his tricuspid valve so they were thinking maybe transplant was the way to go. So they put him on another medication and got some different opinions. That’s when a cardiologist called me from Children’s Hospital Boston. They felt like they would be able to do a repair of his tricuspid valve called a cone repair and also do a bi directional glenn if he needed it. Kayden was in and out of the hospital the next few months with either anything he got basically. His surgery in Boston was scheduled for May. In February, he was in the hospital again and his cardiologist was concerned about him making it until May so he contacted Boston and got the surgery scheduled for March 17. My babys first and only open heart surgery was on March 17, 2011. I was so scared because I knew what UVA had told me back in November. I didn’t want Kayden to see how upset I was so once I left him in the waiting area for his surgery I broke down. I didn’t know if by the end of the day I was going to have my son or not. He was in surgery for about 6 hours I think, when his surgeon came to talk to me he said Kayden done great. He came off the bypass and his heart took right over. He admitted that they thought he was going to give them more trouble than he did but my little man proved them wrong once again. He was in the hospital for 3 weeks in Boston, he recovered well. 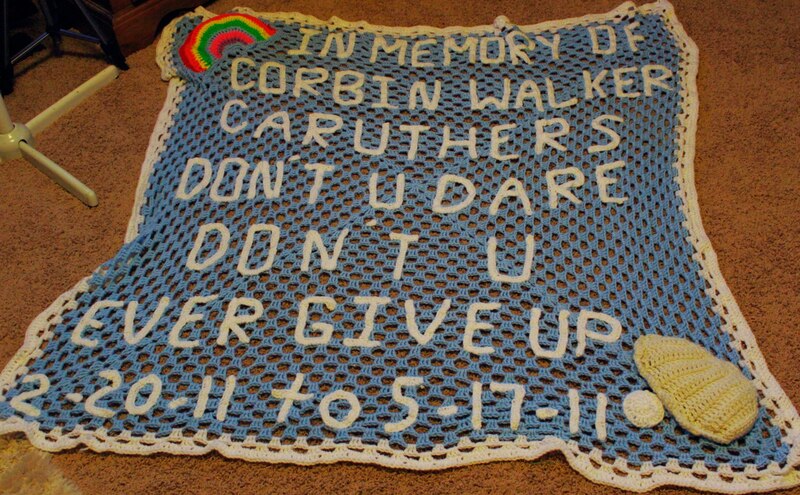 He came off the ventilator sooner than they had expected so that was a huge step for him. When he was discharged the plan was to go to the hotel and leave the next morning. When we got there Kayden was okay for a little bit but then he was ‘wanna go home’, so that did it we left that night and drove the 13 or 14 hours back to Virginia. We were home for a few days when his oxygen dropped to the low 80s one night and he was breathing hard and not eating again. Once again we ended up at the emergency room and admitted to the PICU. He had a pleural effusion on the left side. This was a surprise, I was told usually they show up right after surgery & his showed up 3 weeks later. He was in the hospital with another chest tube in for another week. Slowly he started going downhill again, he wouldn’t eat, wouldn’t walk much, and he was needing his oxygen more often. On June 14, 2011 we went to see his cardiologist at UVA, that was the last time he would be admitted into a hospital. His heart function was worse than before his surgery in March and the repair had stopped working. The only reason they said he wasn’t worse was because of the glenn procedure. We were at the last option, transplant. So of course we were admitted and taken to the PICU, they got a central line in him to start medications and start the transplant evaluation. They had to do another catheter because in November one of the pressures in his lungs were too high and if it were still high then he wouldn’t have been a candidate for a transplant. 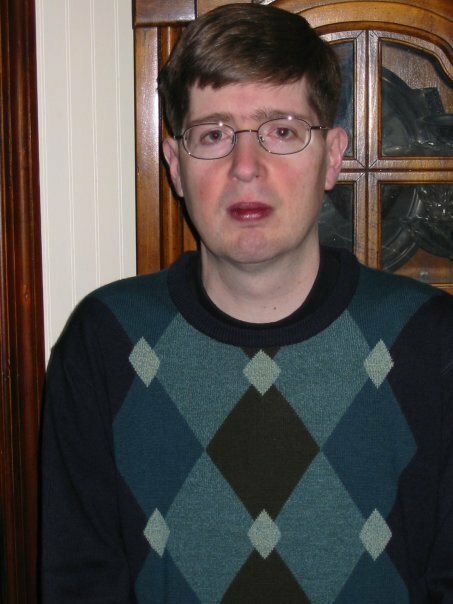 That cath set him way back, he didn’t recover well from it but on June 28, 2011 he was listed as a 1A on the transplant list. He was intubated for a little over a week after the cath, when he came off it he said ‘no more, no more, no more’. Those were the last actual words we heard him say. He took a nap after the nurses got him cleaned up. When he woke up he was so disoriented. He couldn’t control his movements, he wasn’t talking ,and he kept looking around. I had never seen him this way in 3 and a half years. Slowly he would come out of it. He finally controlled the movements, but he still wasn’t talking. Kayden’s last week of life he had a few small events happen that I guess you could say maybe they were signs. One day his heart rate was jumping around and got as high as 215 one time, it was in the 160s-170s and finally settled in the 140s which was still high if you ask me but for some reason they wanted it high. His kidney function had went down one day from the previous day but the kidney doctor was in the room for a minute and listened to him and all he said was give him more fluids. 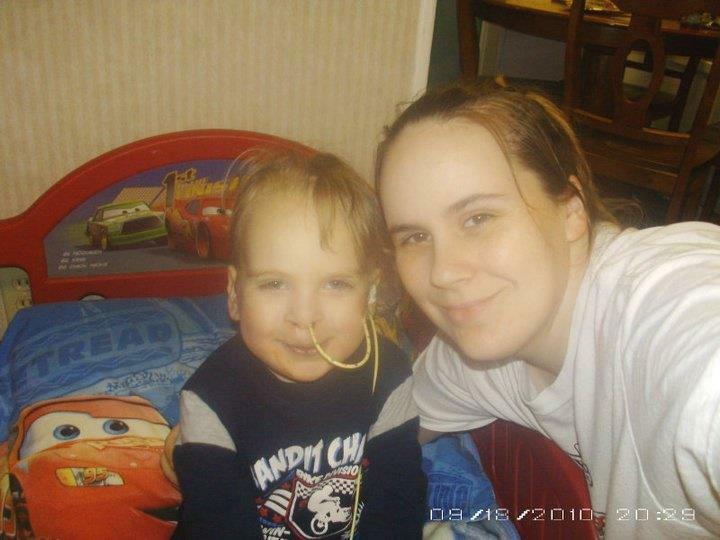 Then on July 13 he was breathing hard, my mom was there with him and was telling the nurses, and also he was spitting up greenish colored stuff and she kept telling them about that and they didn’t do anything. They said it was medicines, I don’t believe that because I’ve seen him take medicines and vomit right after taking them and never once was it green. They listened to him all that day and they said his lungs were clear. The last time I had talked to my mom was at 11 p.m on July 13, and she said he was fine just breathing hard still. At about 1:30 on July 14, 2011 I got the worst call in the world that at first I thought was going to be the best. I saw the area code and thought YES Kayden’s got a heart. When I answered my mom said I needed to get up there we were losing him. I could not believe it I didn’t want to believe it. I got in touch with my brother who picked me up and Kayden’s two brothers and his sister and we all headed towards Charlottesville. I got another call from my mom and she said he was gone, I dropped the phone and just cried I didn’t want to believe my baby wasn’t here. He was a fighter, he couldn’t give up. The whole two hour ride was horrible I cried the hole time, but I never lost hope. I held on to every piece of hope & faith until I walked into his room and saw for myself my baby wasn’t breathing. My baby was gone. He wasn’t coming back. I never thought this thing could have happened to me, not in a million years. 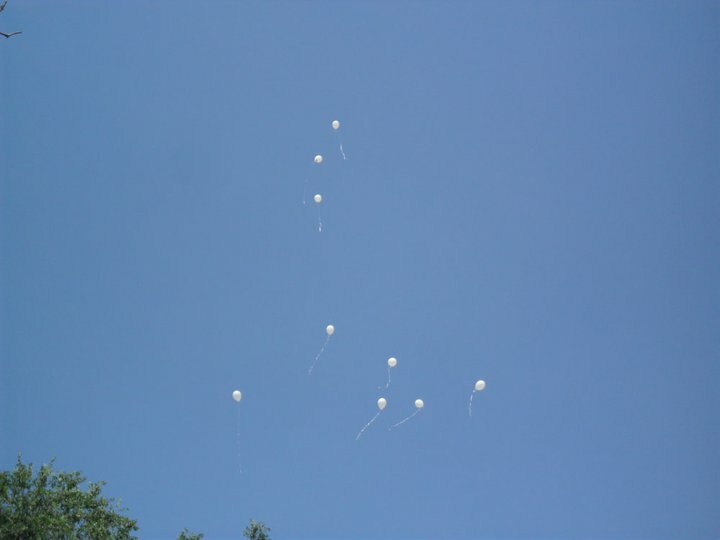 Kayden’s balloon release.. fly high little one.